Media inserts photos, movies, and audio from the Photos and Music apps. Tables offers a selection of table styles in color schemes that coordinate with the template theme you chose. 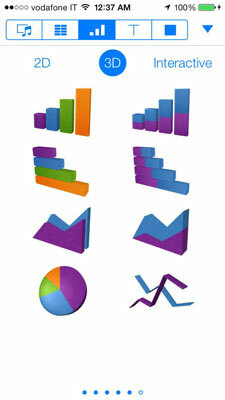 Charts takes data from a table and displays it as a graph or pie chart, 2D, 3D, or interactive. After you insert a chart, follow the onscreen instructions to select the data it will represent. As with Tables, the color scheme coordinates with the template theme. Shapes gives you a choice of simple line drawings that can be combined with text boxes to liven up your spreadsheet or highlight a specific point. Text inserts a text box where you can type parenthetical information or lists. The text box grows to accommodate the text but you can change the size and shape with the resizing handles. Tap the element style you want to insert, such as a photo, a pie chart, or an arrow. The element appears on your sheet. Tap the triangle on the right end of the tabs to leave this area without adding anything. Drag the resizing handles to shrink or enlarge photos or shapes. Tap the Cut, Copy, or Delete buttons in the pop-up menu to take those actions. Tap and drag the element around to place it where you want. Tap the element on the sheet, and then tap the Format button (the paintbrush). Tap the tabs to see the options for changing the appearance or modifying the typeface family, size, and color of any text. Again, choices will be in keeping with the template theme. When you see the Arrange tab, use that to create the hierarchy between overlapping elements.